Coming to the rescue was this video adapter manufactured by Philips. This allowed me to use simply any monitor with VGA. Early Macs had used the DA-15 connector, whilst VGA on PCs used the DE-15 connector instead – both had 15 pins just using a different layout. The DA-15 connector coincidently is the same as what was found on some PC sound cards for use with joysticks, before the transition to USB. When you visit a foreign country where their power points are different, you might bring along a power point adapter. The adapter itself doesn’t change the voltage, it simply allows you to physically connect your laptop or electric shaver whilst away. This video adapter works much the same way. 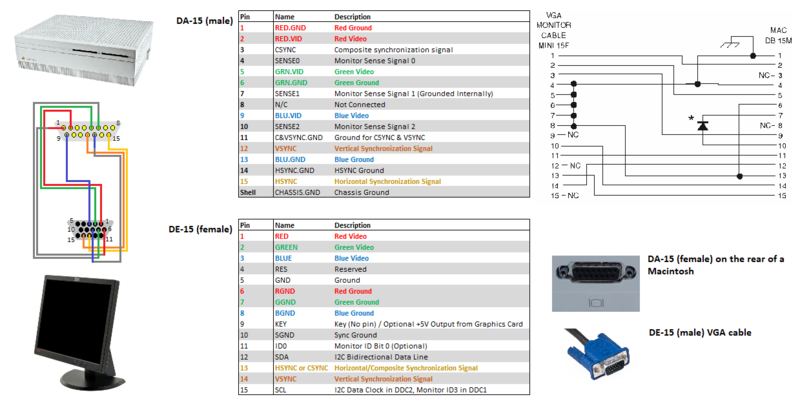 Here is an overview of the pin alignments, highlighting RGB video and the horizontal and vertical synchronisation signals. To the right of the image is the circuit diagram, for those electronically inclined. Not all of these had this feature, though this adapter has four tiny DIP switches to make adjustments as shown below. 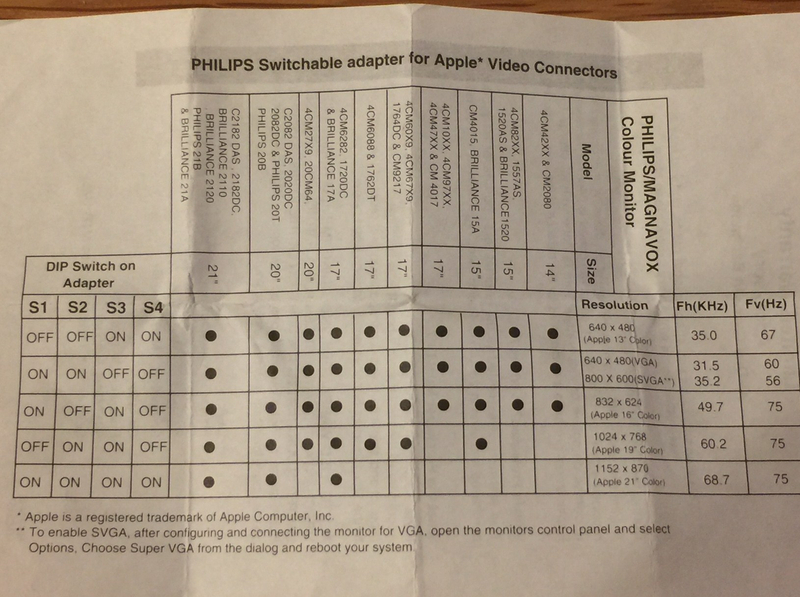 Some of Apple’s resolutions were unconventional (such as 832 x 624) for a PC, so this was to assist users in understanding what were compatible with their Philips and Magnavox monitors at the time. I personally set mine to the second option, for the standard VGA resolution. Reference sheet on setting the switches found on the adapter. As early Apple monitors have faded into obscurity, these adapters while not necessarily easy to find either, are exceptionally handy. Now whilst not aesthetically the same, it gives me the opportunity to start fiddling around with this Mac at last, and maybe others I manage to pick up in future. Connecting a 17″ LCD VGA monitor to a Macintosh LC II.